How to follow:Listen on BBC Radio 5 live and BBC Sport website 19:45 BST (build-up from 17:00 BST); live text commentary on the BBC Sport websiteLiverpool approach Saturday's Champions League final against holders Real Madrid in Kiev with a belief they can "go for the big things" embedded in their DNA, says manager Jurgen Klopp.The Reds, who entered in the play-off round, will be crowned champions of Europe for a sixth time if they win.Real are looking to lift the trophy for a third successive season. "Nobody expected us to be here, but we are because we are Liverpool," said Klopp.A journey that started on 15 August against Hoffenheim will end in glory if the Reds beat the 12-time winners. "This club has it in its DNA that it can really go for the big things," said Klopp. "I am pretty sure in the second before the game, Real Madrid will be more confident than we are but the game doesn't end in that second, it only starts. "I am really happy to be here with this group of players. They fought unbelievably hard to be here. They deserve it. I'm really proud." Zinedine Zidane has won one league title and two Champions Leagues since he was appointed Real boss in January 2016.Klopp, who took the Liverpool job three months earlier, is still seeking a first major trophy. "I'm longer at Liverpool than he is at Real Madrid yet he can win the Champions League for the third year in a row," said the 50-year-old German. "I saw his team playing a lot of times and its fantastic football. Zidane has been a fighter his whole life. "The Reds were beaten by Sevilla in the 2016 Europa League final.Captain Jordan Henderson says they have moved on from that, but it is important for the team to start winning things. "We have learned from that experience and we can use that as motivation," said the England midfielder. "We have moved in the right direction since then. It's important we win trophies and hopefully we will win one on Saturday." Klopp told a media conference in Kiev he had no fresh injury problems before Liverpool's final training session.There are unlikely to be any surprises in the starting line-up, with James Milner expected to return after a minor muscle issue.Klopp will probably have to chose between Dominic Solanke and Danny Ings for the final place on the substitutes' bench.That is because midfielder Emre Can, who has not featured since mid-March, is expected to be on the bench after recovering from a back injury. Third time lucky for Klopp[/IMG]"Going to the Champions League final is difficult to do, maybe a once-in-a-lifetime chance, and I know that is how I felt at the time. "We played an unbelievable game against a strong side and after the game I knew I wanted to have that chance again." 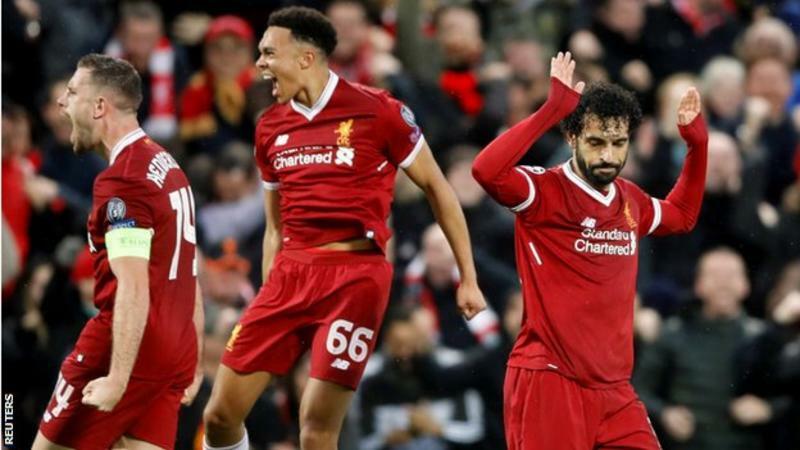 How will Real deal with Liverpool 'Red Arrows'? BBC Sport chief football writer Phil McNulty in KievJurgen Klopp was exactly as Liverpool and their fans have come to expect as he addressed the media on the eve of the Champions League final in Kiev.Klopp, along with captain Jordan Henderson and defender Virgil van Dijk, was in calm and confident mood before facing Real Madrid - with the manager also drawing some laughs along the way.He accepted Real's vast experience will be an advantage before the game but there is no mistaking Klopp believes Liverpool have earned themselves a huge opportunity for sixth crown here in steamy Kiev.The obvious faith Klopp has in his players, and vice-versa, was striking in their media briefing and is clearly a key component in the way they have grown into the Champions League this season. » Quiz: Who made it to World Cup 2018 and how did they get there?